With a new year comes new year's resolutions, and across the globe many people make a resolution to become healthier, to become fitter, or to lose weight, so come January every other advert on TV seems to be targeted at those people. Whether they're adverts for weight loss groups, fitness classes and DVDs, or even government-funded campaigns such as Change4Life, they're pretty hard to avoid at this time of year, and they've got me thinking; what is health? We all have our own definitions of it. For some, it's all about heavy or intense exercise and high-protein diets; for others, it's more about gentle activity and a healthy but balanced diet; and sadly, to some, it's about cutting out carbs and sugars, keeping your caloric intake low and putting yourself through hours of gruelling cardio work outs. While health is different for everyone, and what works for one person might not work for another, I believe that no matter what, health should be something that makes you feel good. It should make you feel good mentally; keeping your moods relatively constant and positive, helping you stay relaxed, and making you feel more motivated and energised; and it should make you feel good physically, too; it should help keep your energy levels up from morning through 'til evening, it should help you rest well, and it should make you feel fit and strong. And, most importantly, it definitely shouldn't be something that drags you down and makes you feel restricted or prevents you from enjoying yourself. Health isn't about allowing yourself thirty grams of low-fat cereal, or drinking some diet shake that you really don't enjoy, or dragging yourself out of bed at five in the morning when your body is crying out for an extra hour of sleep, at least not to me it isn't. To me, health is all about balance. It's about eating well, in a way that suits your lifestyle and your body's needs, exercising in a way that you enjoy and that also suits your lifestyle, and it's about moderation; it's about listening to your body and allowing yourself to indulge or take a rest day when your body says that's what it needs, and not feeling at all guilty about it. Health should never feel like a chore or a punishment; health is about treating your body with the love and respect that it deserves, and living a lifestyle that you enjoy. It's about feeling strong and invigorated, knowing that you can listen to your body and respect its needs, and living in a way that makes you feel well and alive, and it's not just about diet and exercise - health can also extend to our mental wellbeing and our relationships, both with others and with ourselves. As I've said, health isn't the same for everyone, and my version may be very different to yours, but I thought it might be helpful to share some of my health inspiration, as no matter our interpretation of health, we can all benefit from a little inspiration. The Instagram account of The Chalkboard is full of delicious looking meals, smoothies and juices to inspire your mealtimes and some beautiful work out gear to make your work outs just that little bit better. I've been following David's blog for a good few months now, but only recently did I discover his and Luise's Instagram accounts, where they share photographs of wholesome, plant-based food and their travels with their beautiful family. An Australian company selling vegan protein powders and health-boosting hot drinks with a seriously inspiring Instagram account; vegan meals, nutrient-packed smoothies and some seriously toned ladies - scrolling through this feed has given me the motivation to work out on more than one occasion! After seeing Ella pop up on Twitter and Instagram rather a lot lately, I decided to take a little look at her profile, and I was instantly inspired. Having suffered a rare illness, Ella made the transition to a plant-based, gluten-free and refined sugar free diet in order to heal her body. That may sound extreme, but by no means does she deprive herself! You see those brownies at the top there? You can find the recipe on her blog! As someone who loves to eat a plant-based diet and generally likes to keep their intake of refined and processed foods low, Ella's feed and blog provide endless inspiration, especially when my meals start to get a little repetitive and I want to try something new. I mentioned Ella recently in my bloggers who inspire me post, and here she is again! 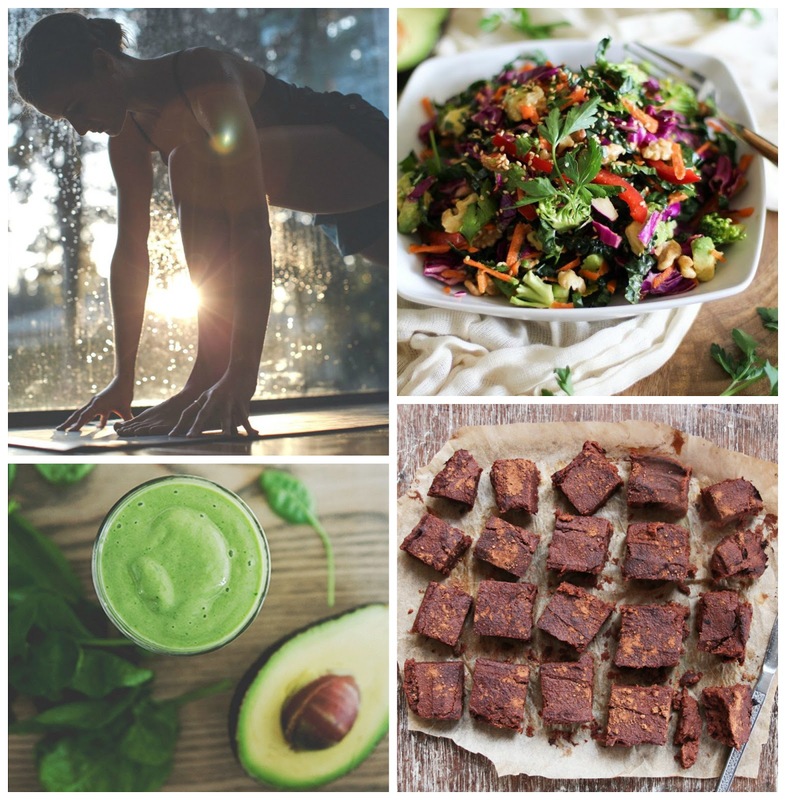 As well as gorgeous photographs, Ella is always posting tasty, healthy meals and promoting general wellness, both of the body and of the mind. My favourite juice shop, 42 Juice, and one of its founders; Coral's feed provides me with raw-food inspiration and uplifting quotes, while 42 Juice's feed fuels my desire to get a juicer - I need to be able to recreate their wonderful juices at home! Kelly's feed is just full of delicious-looking vegan food, showing that you can lead a vegan lifestyle even as a student. Kelly's food always looks so good and hearty, and always starts some serious oatmeal cravings. I love Siobhan's account not only because everything she posts is plant-based, wholesome food, but because it reminds me that it is okay to indulge in chocolate and eat bread, pasta etc. on a regular basis. I never try to cut out those sorts of foods, but I do tend to worry that by eating too much of those things I'll end up feeling bloated and sluggish or experience some water-retention, but Siobhan's posts show me that you can eat those things and still feel healthy and full of energy. I first started following Lauren around two years ago or so when I first started making some healthy changes to my diet and lifestyle, and she still inspires me just as much now as she did back then. Her green smoothies and colourful juices always inspire me to get more greens into my diet, and she shares my undying love of sweet potatoes. Lauren is such a kind soul and always inspires me to be kinder, more compassionate, and more mindful. Who are some of your sources of inspiration? 100% with you on this one. I loveee Siobhans, Ella Woodwards and Ella Dentons blogs also. So inspiring in terms of living a healthy, positivelife - putting yourself and your well-being first. Oh I do as well! And aren't they just?! They all seem so happy and each of them is just a picture of health - very inspiring.